The risk of knowing well or quite well a city you want to write about as a travel writer is to focus too much on the critical perspectives and writing too much about what not to do in the city rather than what's really worth to see if you only have a couple of days to spend there. To be very honest from the beginning, Bucharest is by far one of my least favourite cities in Romania, but from a trip to another or a longer stay to another, I learned to know it and for the writing purposes it might be enough. The city changed a lot - maybe too much - in the last decades, and this can be see especially in the architectural development - and its big failures. 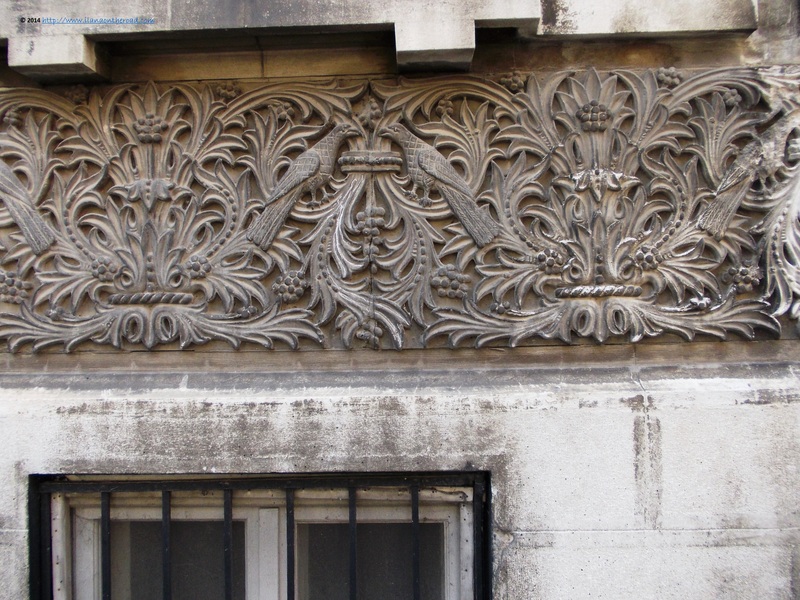 However, sometimes completely by chance, some streets still kept some original architecture from the end of the 19th-beginning of the 20th century that the visitor cannot ignore it. 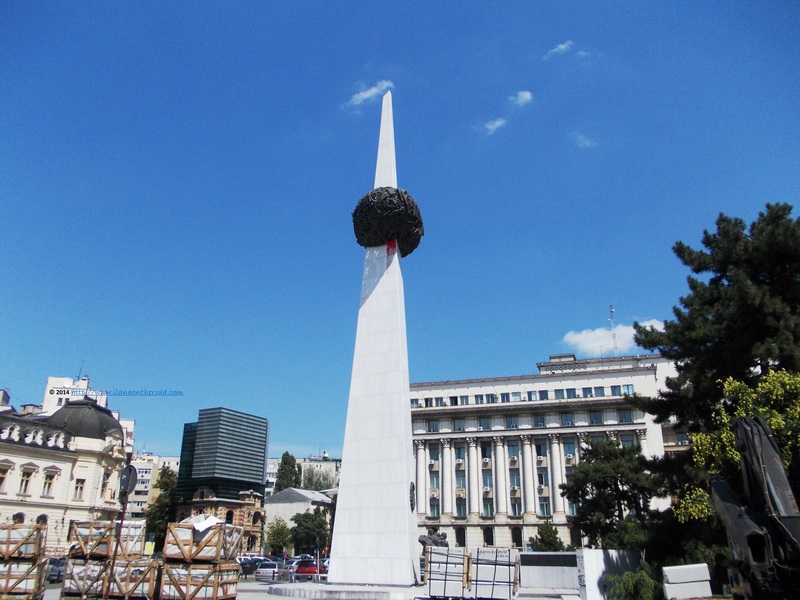 My favourite one is situated at the beginning of Popa Nan street and used to belong to a worldwide famous local singer, Maria Tanase, that also used to be the muse of the famous sculptor Constantin Brancusi. 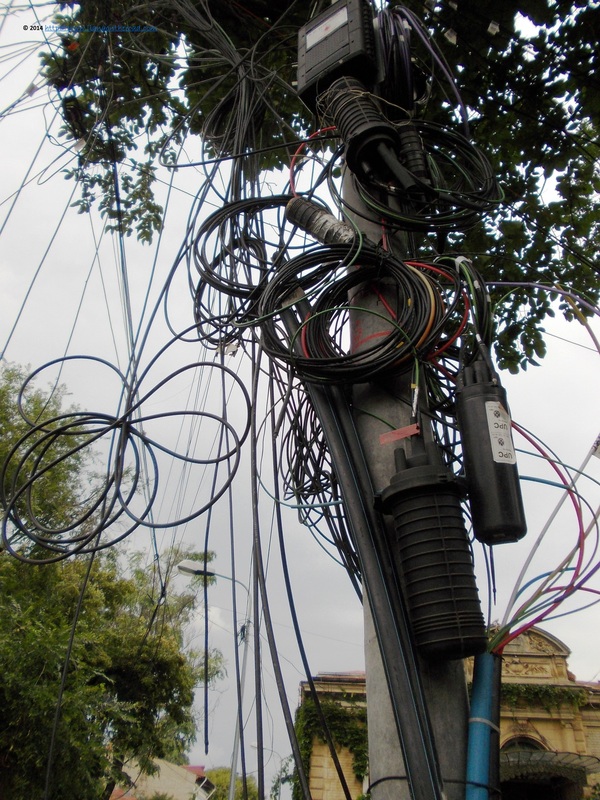 If your observation is sharp enough, you might see very often these many-plies of cables. It looks exotic, scary, mysterious or threatening, but there is nothing to be afraid of: the technological needs of the city overpasses the technical ingenuity of its urban planners and at least for now, this is how various communication cables are set together - not necessarily in the most elegant way. 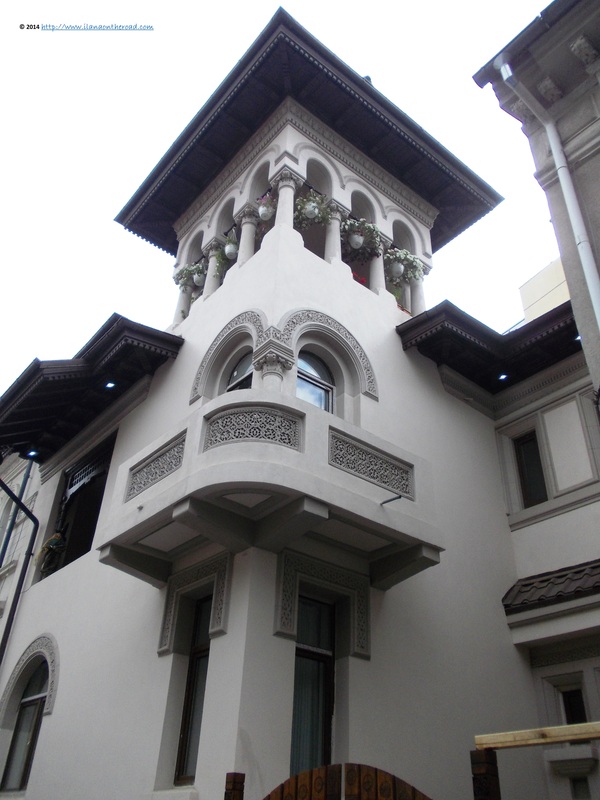 Most often, behind the curtain of cables, traditional architecture can still be admired. The local 'brancovenesc' style is integrating folk and religious motives into solid building structures that used to be designed for the middle class entrepreneurs and traders whose development in the inter-war period was stopped by the installation of communism. Many of those villas were lost for ever, destroyed for being replaced by architecture-by-the numbers, but many of the surviving constructions went into new hands and restored. As I haven't seriously visited the city in the last five years, I enjoyed the discovery of new interesting destinations, including shops. The former communist store Eva, from blvd. 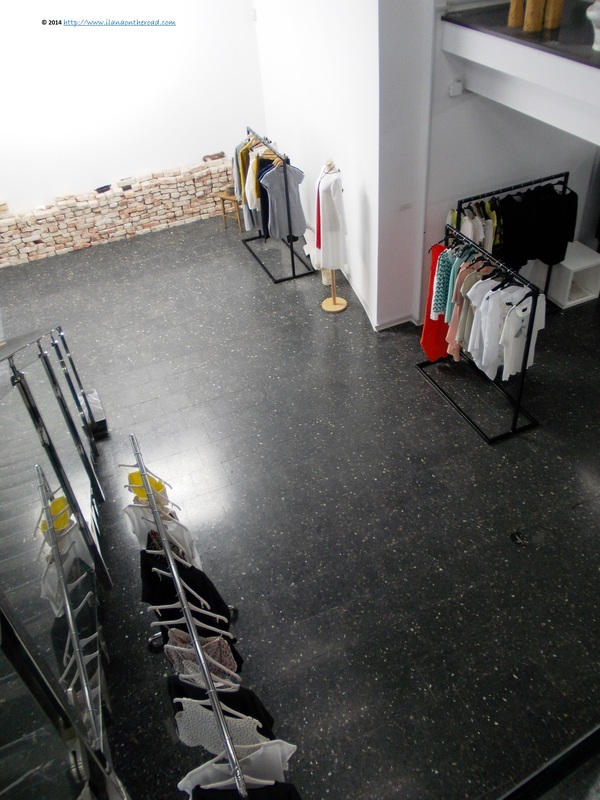 Magheru, was turned into an interesting exhibition of products created by local designers. Some of them were so good that I seriously resented the frustration of being on a very tight long-time travel budget. My favourite were the works by Adelina Ivan, Venera Arapu - whose pieces of fashion design I'm in love with for a long time and even have some of them in my closet - Stephan Pelger and Carla Szabo. 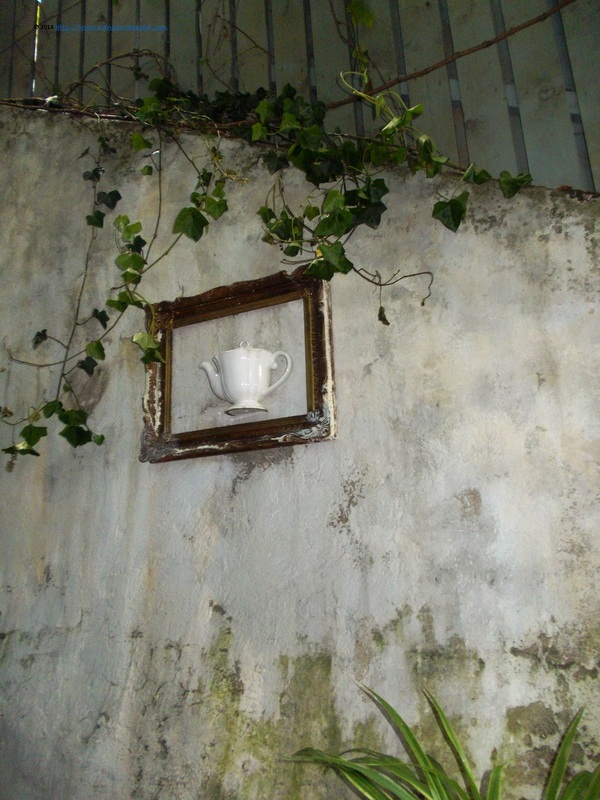 Although at the first sight, the Magheru avenue, connecting University Square to Romana Square, might look very contrasting, with new and old-style shops, some neglected buildings, parking lots and hotels, there are many interesting spots and information telling short stories about the city. 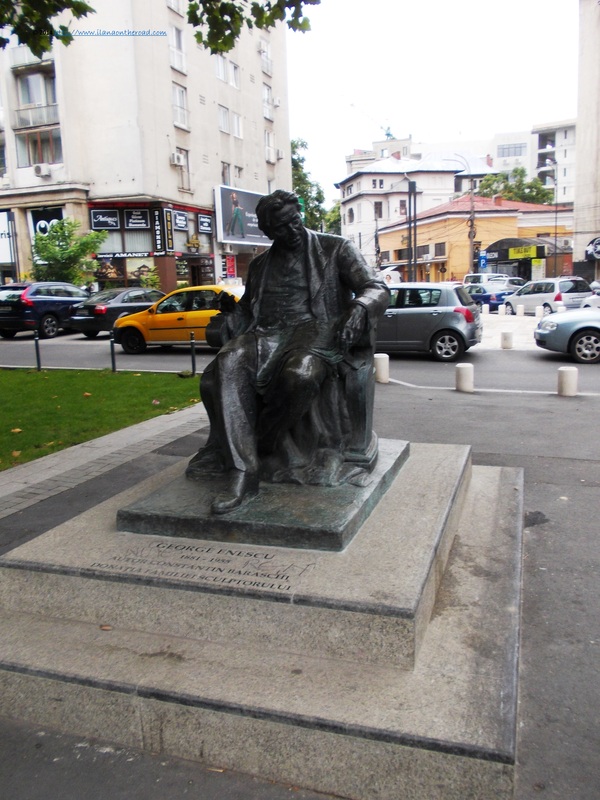 Like the statue of the Romanian composer of international reputation George Enescu, whose statue is situated close to the entrance to Eva shop. 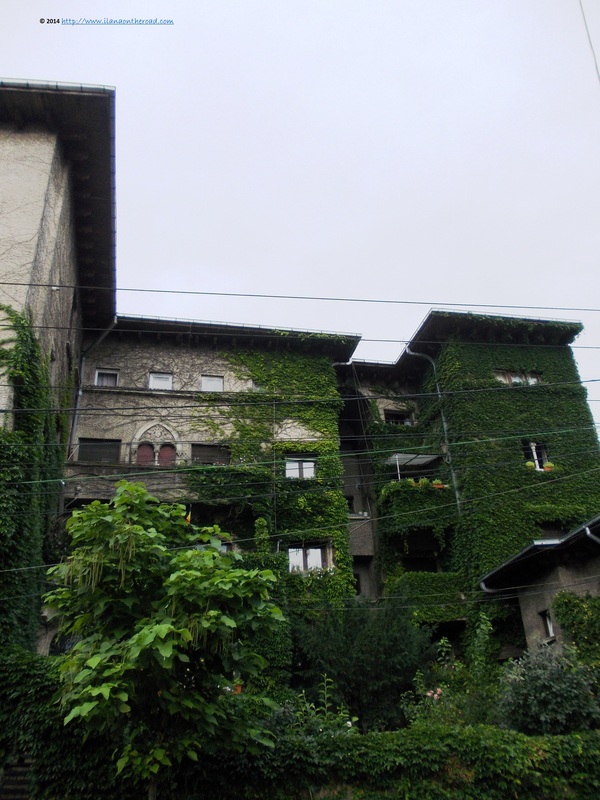 There is also a museum in the city dedicated to his life and activity - at Cantacuzino's Palace -, hosted in the house where he also used to live, an interesting work of architecture in itself. On the same avenue, Magheru blvd. 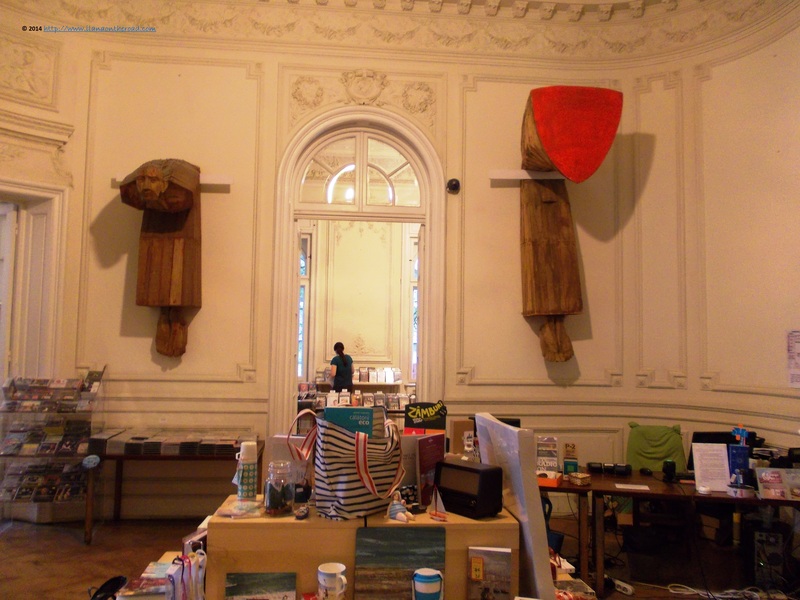 there is a small refuge that both local intellectuals and expats love: Carturesti bookstore, with Romanian and English books and music, as well as different quality design creations. 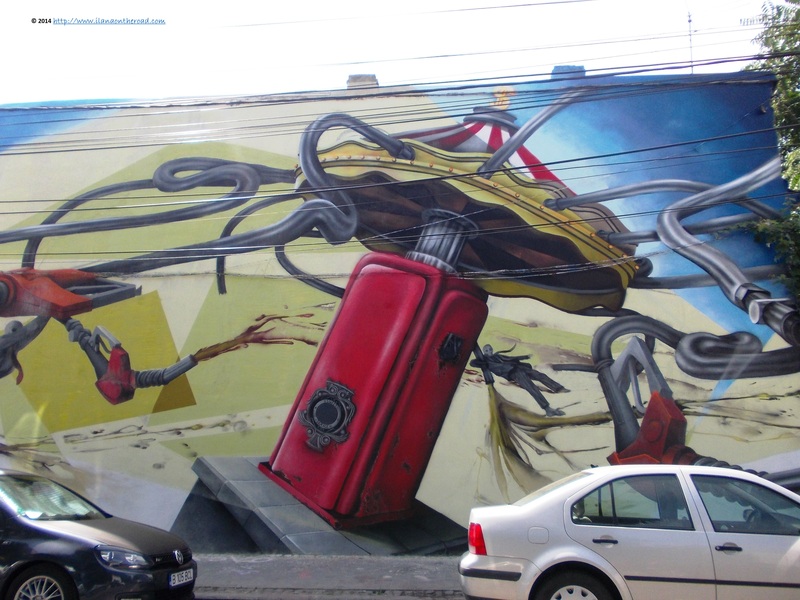 Nearby, at Ciclop Parking, I discovered some interesting works of street art when and where I expected less. 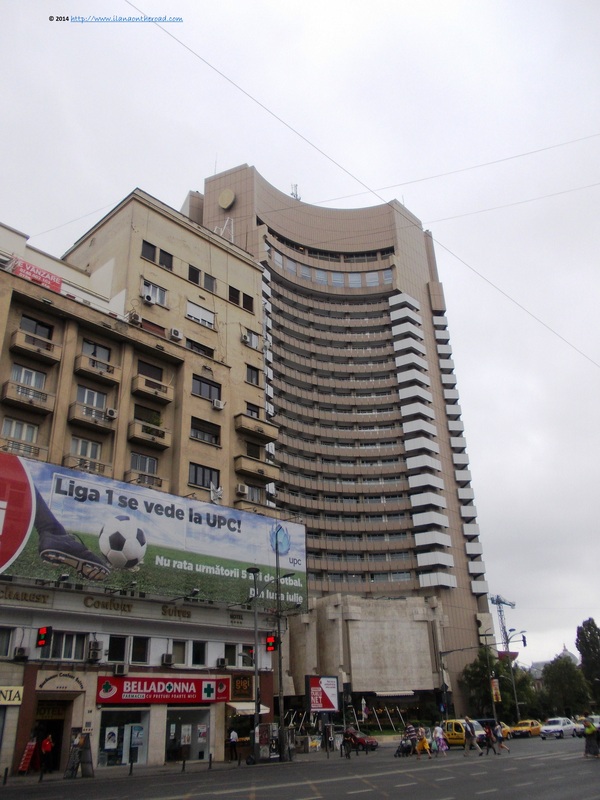 As you visit Bucharest in our times, in the first half of the 21st century, you have the choice of many hotels and nice accommodations, but once upon a time, Intercontinental Hotel used to be by far one of the most famous, as during communist, foreigners were not allowed in too many places - at least not without strict surveillance of the secret services. From the top of the hotel, one can have an overview of the city, with its various - sometimes chaotic - stages of development, but also an expensive drink at the bar. 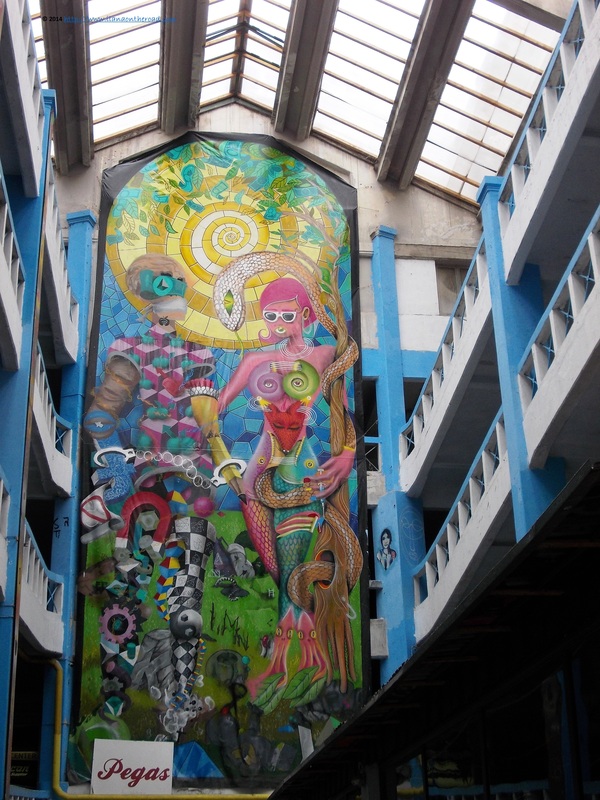 The University Square is not only a meeting place of students - the Faculty of Geography, Philology, Architecture and History are hosted in the buildings around - but also a former meeting place of anti-governmental protesters at the beginning of the post-communism era. There is another building in this area whose presence cannot be ignored: the National Theatre that this summer was in process of reconstruction. 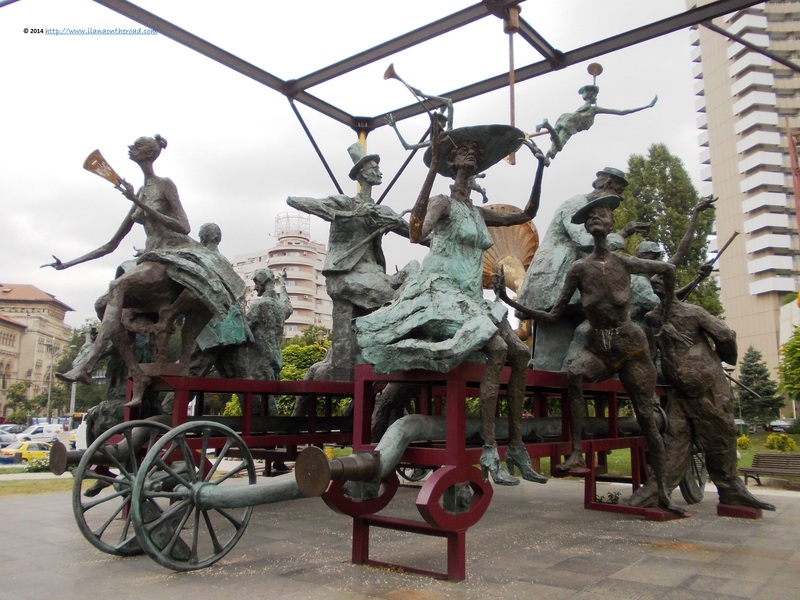 An allegorical installation of statues was recently created, giving to the entire area a certain surrealist touch. Going far away, near Unirii Square, the shopping temptations are threatening your credit balance, but you can just change your focus and look instead at the concert of fountains around People's House. The entire area with many small traditional was almost overnight demolished, creating a lot of personal dramas. 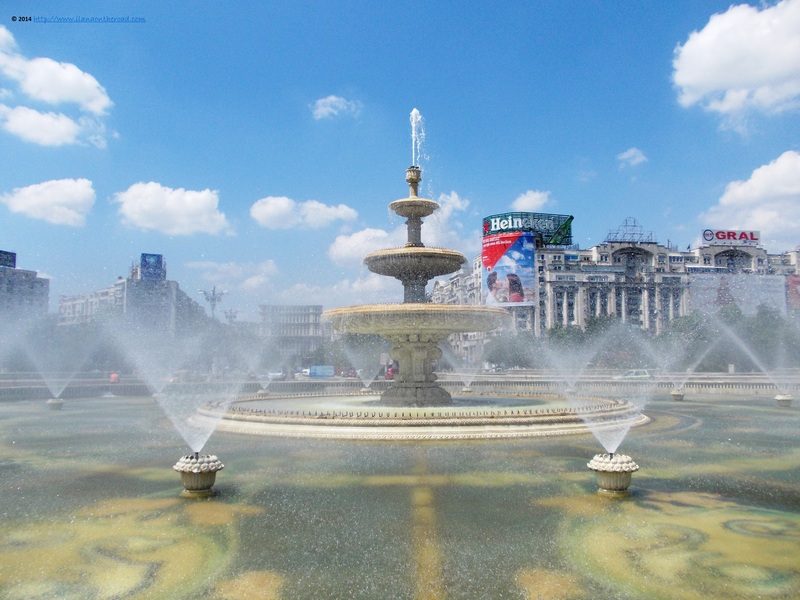 In the summer, the fountains bring more life to the communist baroque architecture of the buildings around, on the avenue that for a short time was called - The Victory of Socialism. In the central area, you can rarely avoid the profile of People's House/Parliament Palace, the second highest after the Pentagon, hosting the local Parliament and other public institutions. Special guided tours in English are available and can be booked on their website, at least one day in advance. The construction started in 1984 and was finished many years after the end of communism. The interior looks spectacular, overwhelming and incredibly lavish, especially if you think about the famous chandeliers adorning some of the rooms, some of them using at least 7,000 light bulbs. 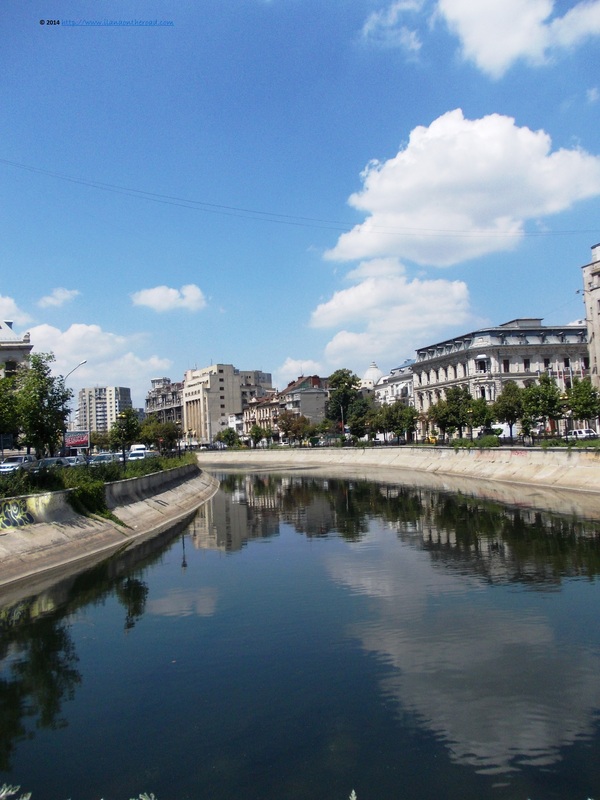 Nearby, the Dambovita river, that was dramatically cleaned up in the last decades and which creates a lot of problems to the metro network during the rainy days. Otherwise, not a spectacular water presence, and not used for tourist purposes. 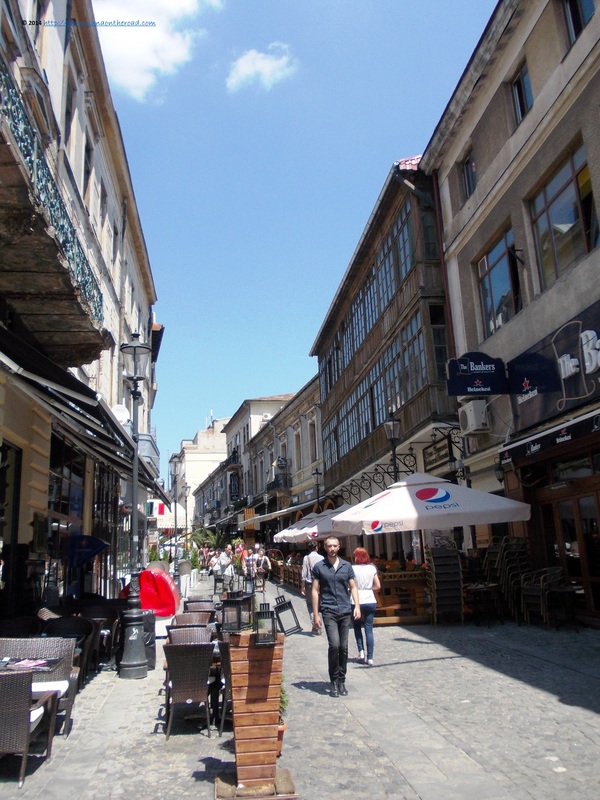 Near Unirea square, most visitors will go to the Old Town, where besides lots of shops and hotels mushrooming, there are also some old museums, and galleries, including the old Bucharest citadel, explaining the city history. 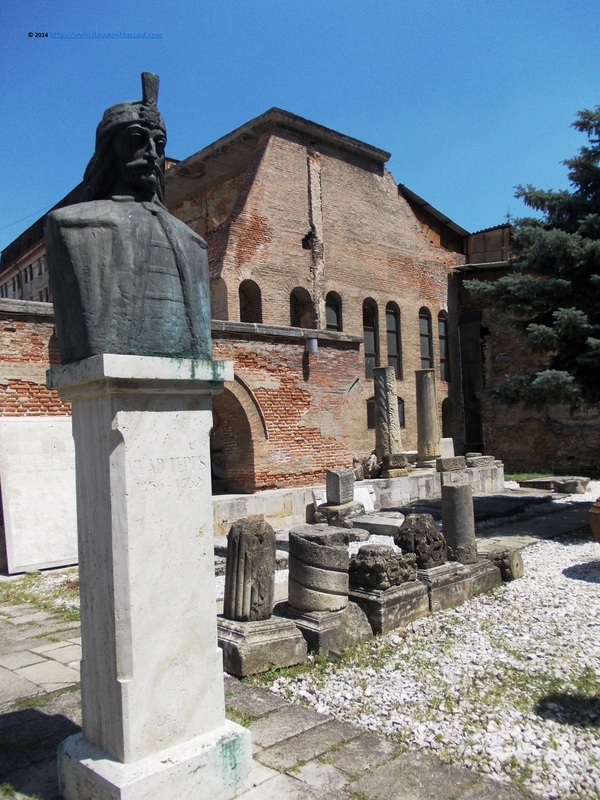 Another interesting source of inspiration and information for those curious to know more about the city, the Sutu Palace, just near University Square is recommended. In the last years, the Old Town, with its famous street Lipscani - a very local translation of Leipzig, a former street of traders from all over the world - went through a dramatic process of reconstruction. The result: a lot of bars, shops and open air restaurants. Due to its high concentration of tourists, the prices might be a bit higher than in the rest of the city. 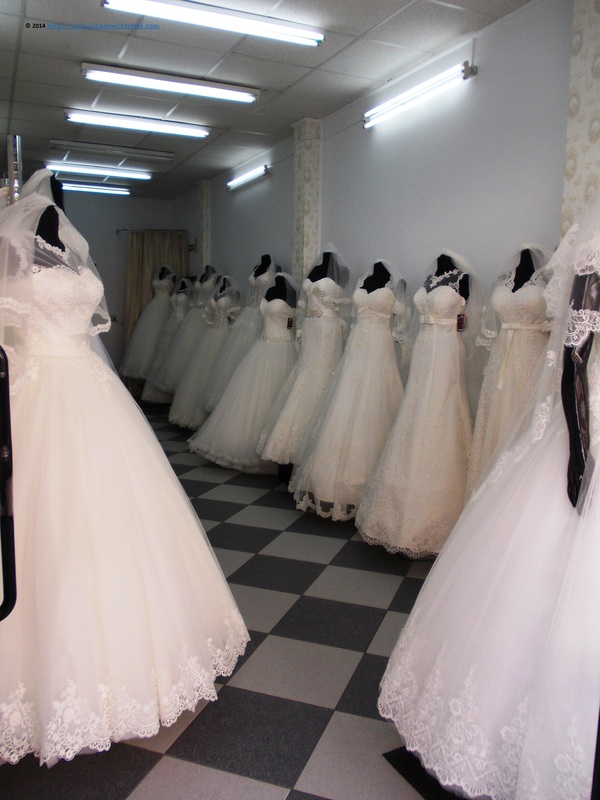 Some old shops, including the one selling wedding dresses were still there. 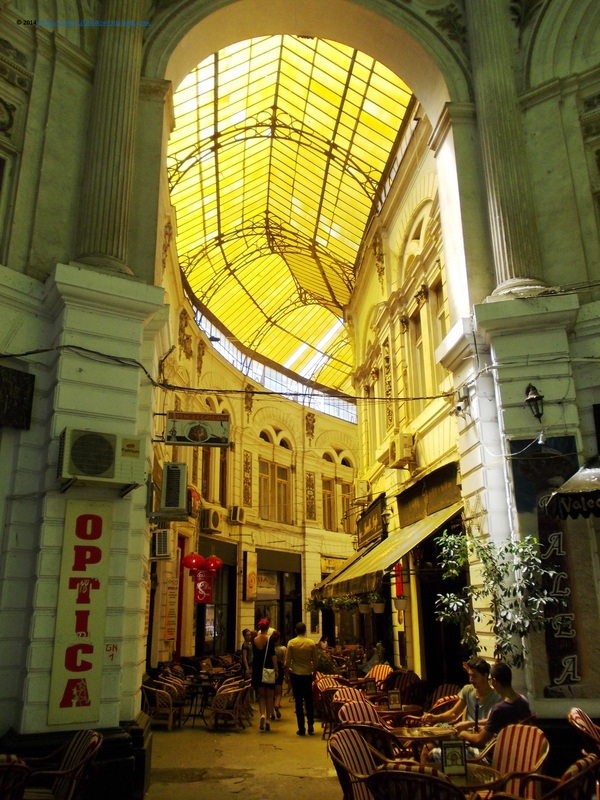 Hidden close to the National Bank building, Villacross Passage offers a oasis of quietness and a couple of Oriental shisha lounges. 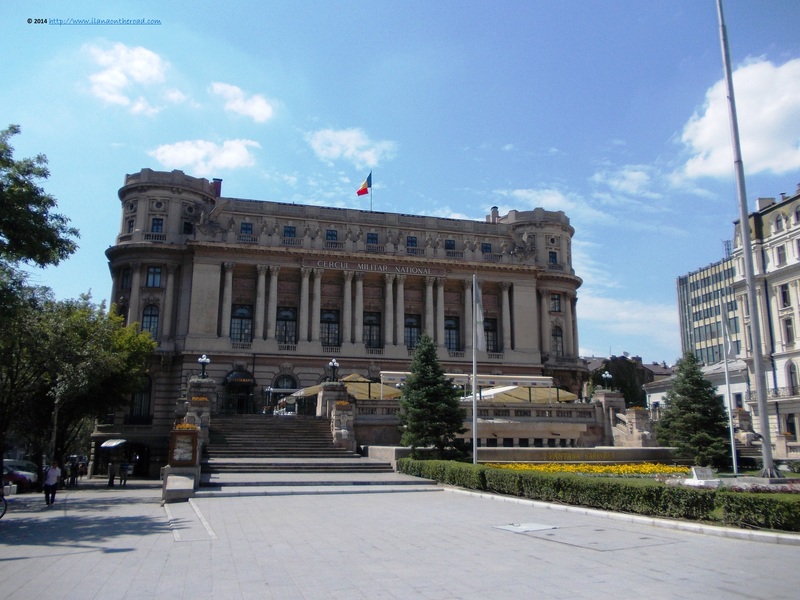 Nearby, the Museum of History which has, besides interesting historical information that you might not know about Romania, the National Treasure, of old jewels mostly gold and precious stones, testimony about traditional handicrafts and traditions. The Old Towns abounds in foodie offers, including the iconic 'Caru' cu bere' or 'Hanul lui Manuc'. I rather decided for something more exotic, like the Shushiko, whose main disadvantage was to have the outdoor space situated just opposite some big garbage collection corner. As the summers in Bucharest are very hot, expect some flies coming up and down your food very often due to this. Otherwise, the service was unexpectedly fast and indoors there is air condition and clean. 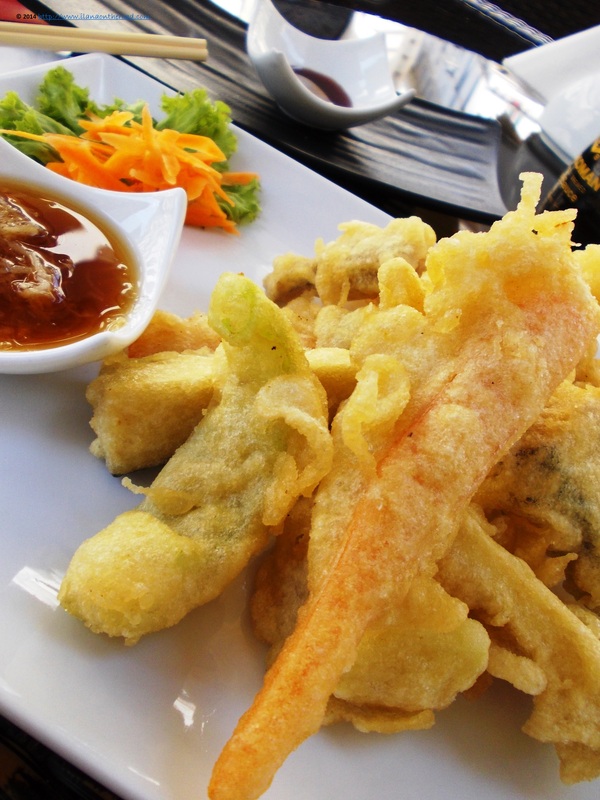 The veggie tempura - carrots, zucchini - was tasty, although the dough was a bit too much, but was brought warm and combined with the soy sauce tasted better. The edamame were well cooked and the avocado tamago sushi not spectacular, just the usual taste expectation. From there, the trip continued in other parts of the city, still keeping close to the central area. The Military Circle is another historical reference, with an outside terrace serving beers, among others. 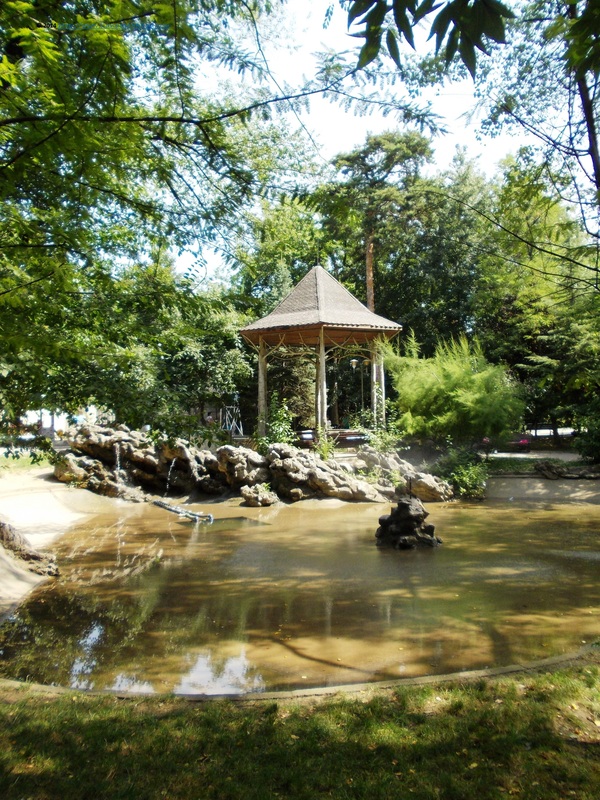 Just 10 minutes of walk from there, the Cismigiu park is a recommended destination for the summer time. Another famous and bigger park, Herastrau, with a huge lake where you can rent boats and make bike tours around, is situated on the other side of the city. Even after more than one visit in the city, the cocktail - not always successful - of architectural sizes and building heights is unusual. 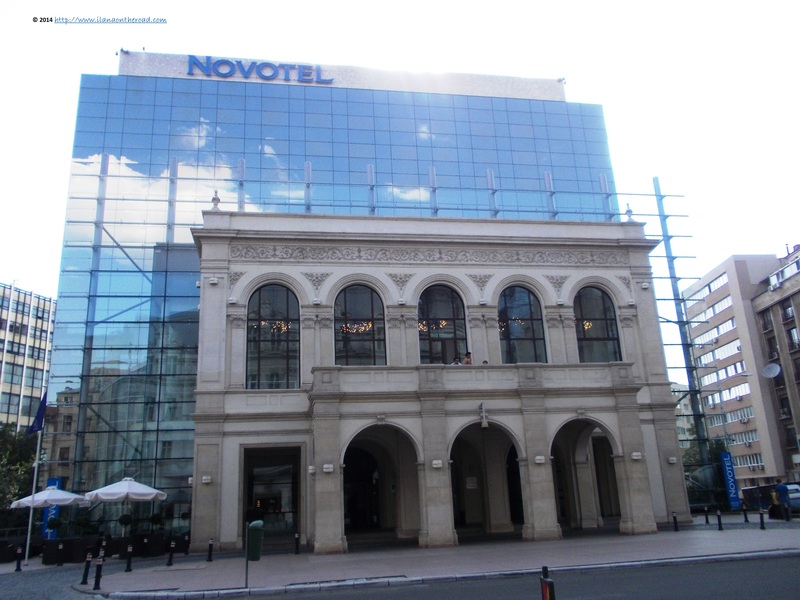 Sometimes, the old-new school of architecture succeeded to change the perspective, as it happened in the case of Novotel hotel, whose glass wing was politely and naturally added to the old structure, dramatically reconstructed. The mother of all contrasts is the Revolution Square, just in the front of the building where the communist dictator Ceausescu had his last speech. 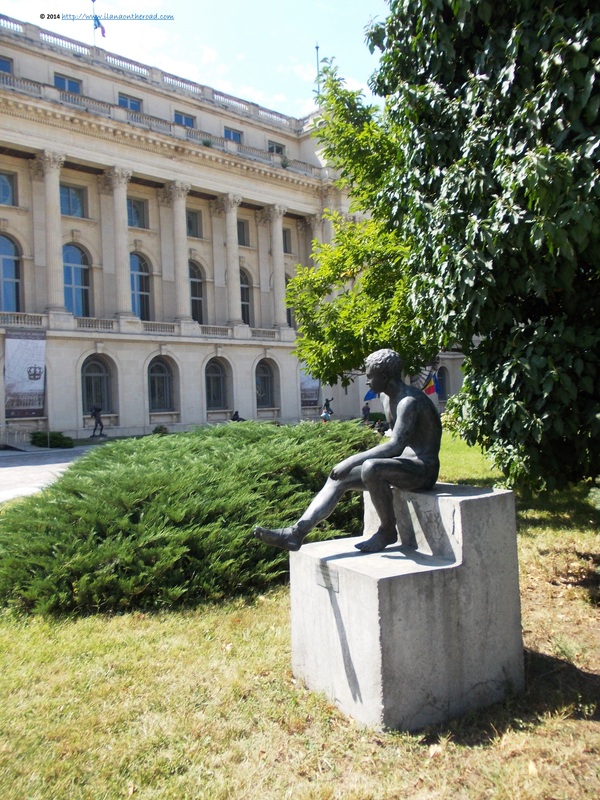 Controversial statues with ambiguous artistic messages and highly disputable artistic choices co-exist with the classical building of the Central Library or other statues of ante- and post-communism political personalities. The former Royal Palace, currently the Museum of National Art is the aesthetic refuge against the overloaded discourse of the street. 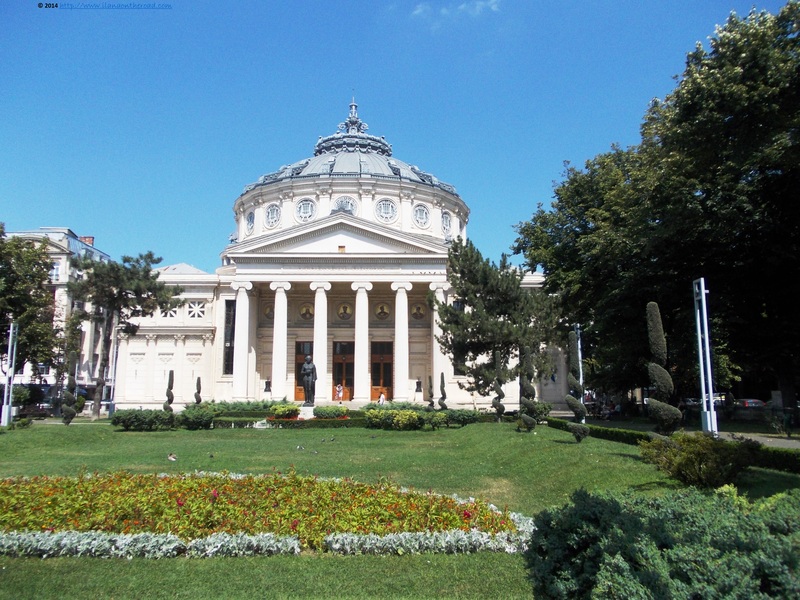 It hosts an impressive collection of traditional Romanian art and collections by world painters that necessarily should be on the priority list of any visitor in Bucharest. During the anti-communist riots from December 1989, part of the museum, including some valuable works of arts, were partially destroyed. 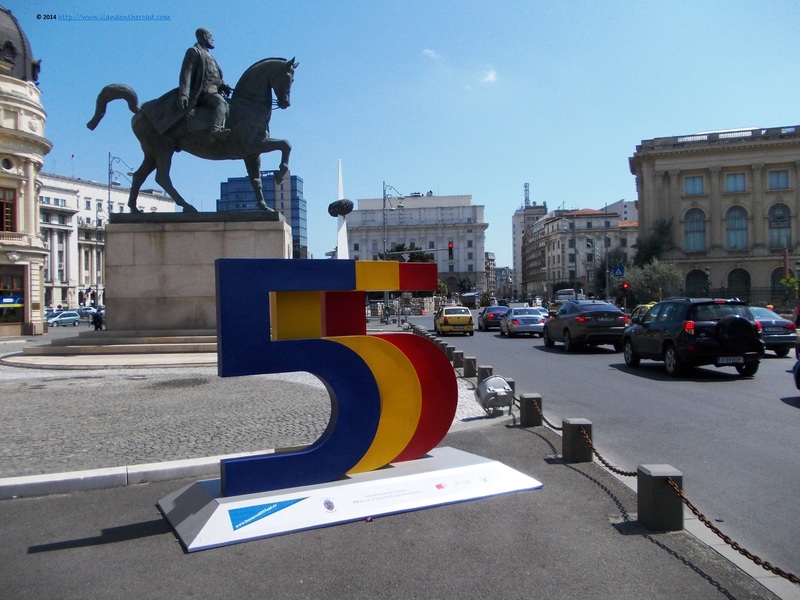 On the other side of the street is the statue of the former King Charles I, and close to it was installed a sign reminding, in the colours of the national flag, that the city is celebrating this year 555 years since is documentary mention. 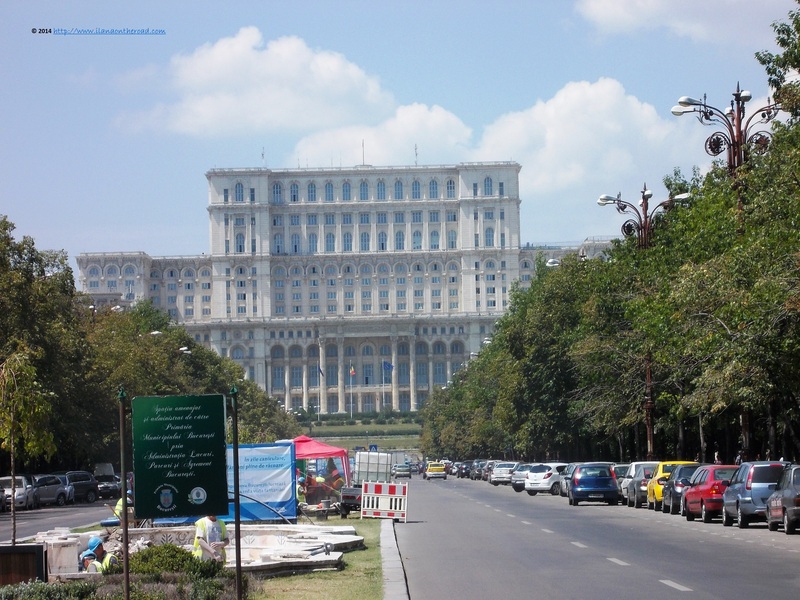 The streets around are always busy, with the high traffic coming and going to Calea Victoriei. Inside the Romanian Athenaeum the noise stops leaving the floor to the classical music. 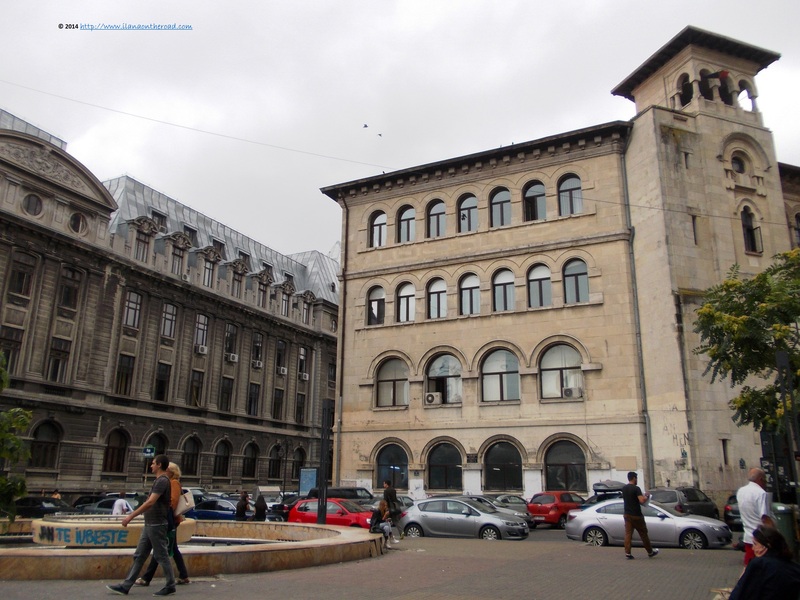 Every two years, in the autumn, here it is organized the international classical music festival 'George Enescu' and very often, you might encounter free open air concerts organized in the front square. When there are no concerts, a short visit inside is recommended for admiring, among others, the historical fresco explaining various historical moments. The streets and small shops on the streets around are charming and with a stylish yet youngish air. 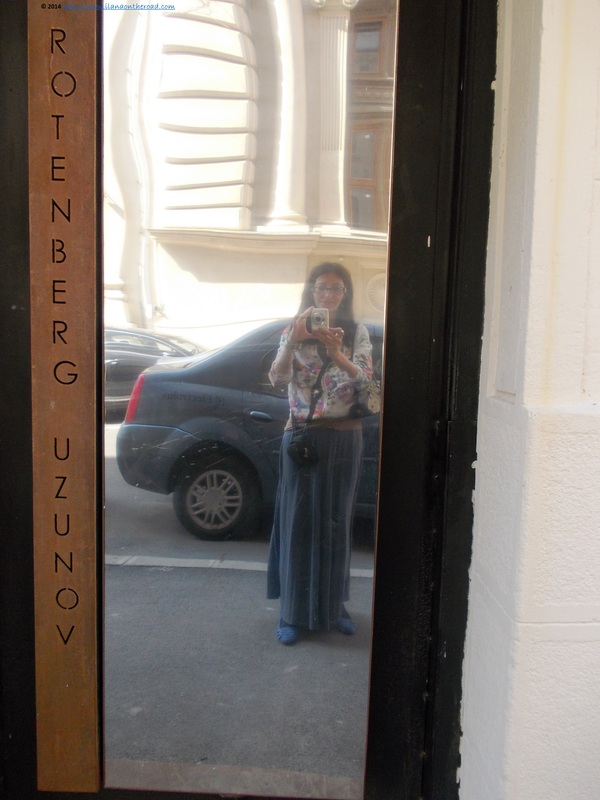 With a revolutionary selfie mirror installed on one of the doors of the shops near Hilton Hotel. But I did other interesting things instead of taking my selfies. 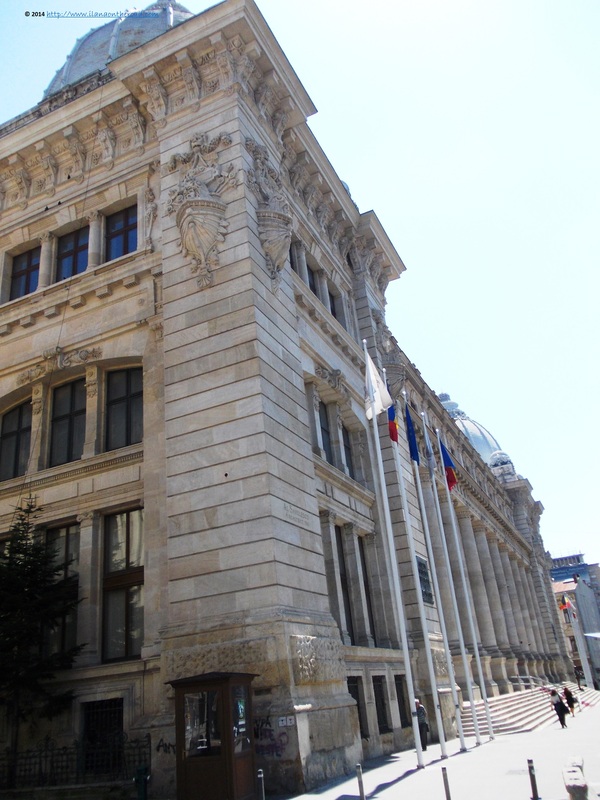 Like, for instance, visiting (finally) Theodor Aman Museum, dedicated to the work and life of the founder of the Romanian school of Fine Arts. 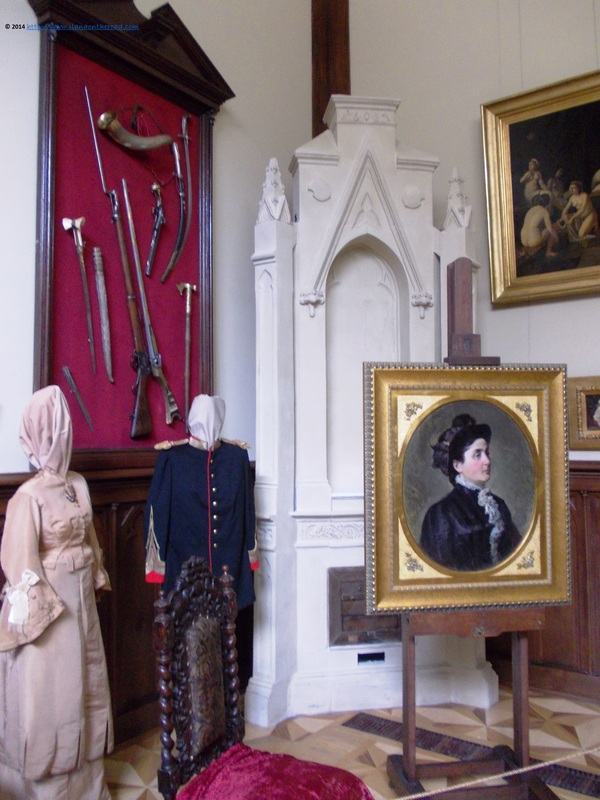 Besides the valuable works of arts exhibited - many influenced by the French culture, as in the case of the literature as well - the architecture of the house tells its own story about the living habits and costumes from the end of the 19th century as well. Nothing compares, though, with the pleasure of meeting fellow travel bloggers while on the road. 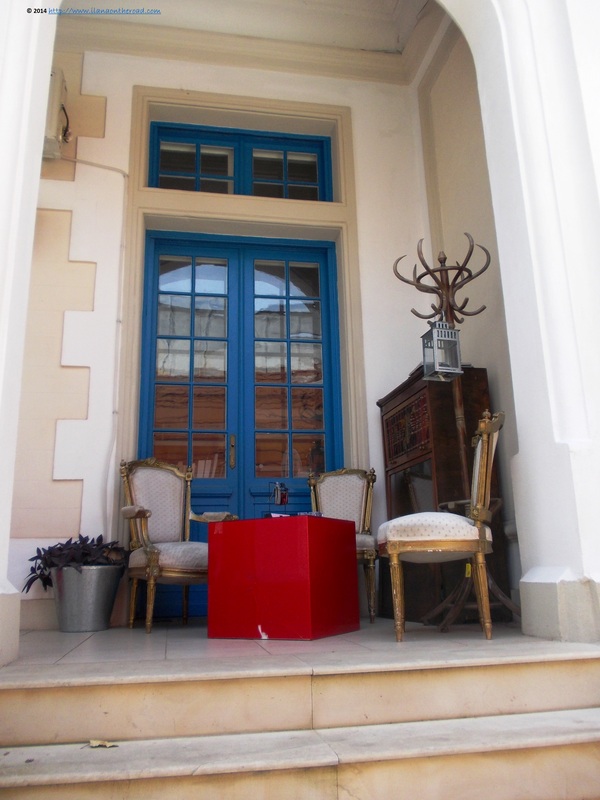 At the cosy Infinitea, hosted in a classical garden house in Cotroceni area, Vlad, from Eff it, I'm on Holiday shared with me some tips and thoughts about the city and travel blogging. Tea houses were introduced in the city a couple of good years ago, but remain a stylish option to spend some good quiet time with a flavoured cuppa and friends in the city, both during the summer and in the winter. 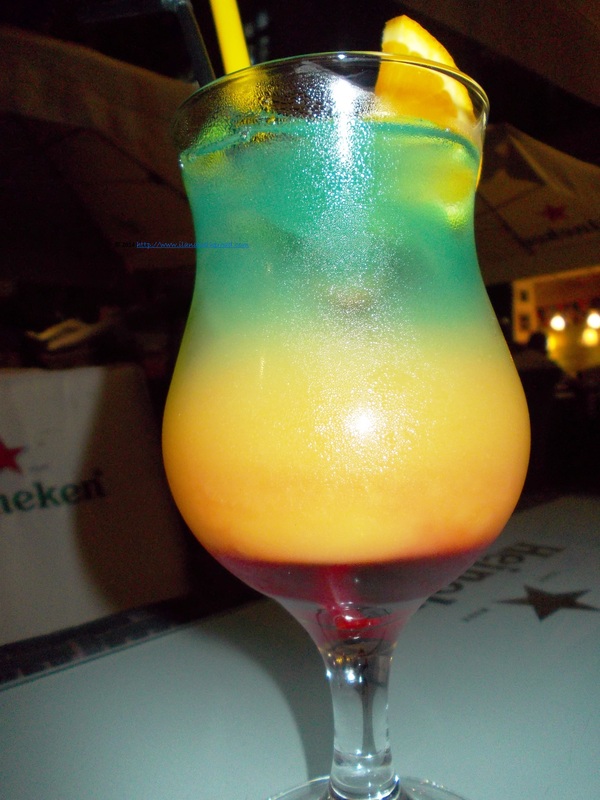 At a terrace close to the statues from the University square, late in the evening, I quenched my thirst with a rainbow non-alcoholic cocktail at Infusion. In the vicinity, during the summer, an open theatre is playing various movie hits of the year(s). At the recommendation of Vlad, I checked the next day some more street art, this time on Arthur Verona street and was not disappointed by the diversity of works and styles, as well as the insertion of the work within the urban narrative. From there, I arrived to one of my favourite parks, Gradina Icoanei and Ion Voicu, discrete islands of green quietness in a city of busy and sometimes too nervous people. On Blv. Dacia, where a lot of embassies and diplomatic representations are situated, I paid a short visit to the classy French Institute - closed during the summer - where I spent a lot of time in the company of French literature and the special ambiance of a place where it looked there is no place for the outside world. After long days of explorations of the city, getting lost without a proper map other than the language, in the most far away areas, meeting a lot of young people and discovering new artists and designers and writers, I left the city with an enriched impression. I still don't love Bucharest very much, but getting to know it more is my polite way to show my availability for more understanding at least. With so many histories and its rich architecture, this city will always have some secrets challenging me to discover. One day, will be back. For some live videos of the daily life, have a look at my YouTube videos here, here and here.